5 Roadtrip Activities 4 Kids! Got summer travel plans with the kids? Does the thought of being trapped in a car for hours on end with your little ones give you anxiety? Have no fear...Tot Squad is here to save the day with our TOP FIVE favorite activities to entertain the kids that don’t involve a tablet, smart phone or gaming device. This is fun and really helps pass the time: Simply download a fun, printable checklist like this and have the kids keep their eyes peeled for each item on the list. The first family member to get all the items gets a prize! “Paint with water” books come with their own refillable water pen and several pages that kids can “paint” with water and color appears with every stroke. Very young Rembrandts will feel a great sense of accomplishment by producing their own painting, in color! Window clings (or jellies, as they are sometimes called) are an inexpensive activity children can entertain themselves with, if they are seated next to a passenger window. Just ensure your child is old enough to know to not put these in their mouth. With young children, we advise avoiding beads. They can end up in an ear, up a nose or even worse, down the throat! Instead, try our snackable necklace idea. It’s simple way for children to work on their fine motor skills and they can consume it afterwards. You can use Cheerios, lifesavers, fruit loops or anything with a hole in the middle that is age appropriate. Simply use a piece of string or yarn with a big knot on one end and watch your kids happily create their own edible necklace! A perfect activity for a road trip. Does your little one love cars? Then they will love this version of road Bingo. 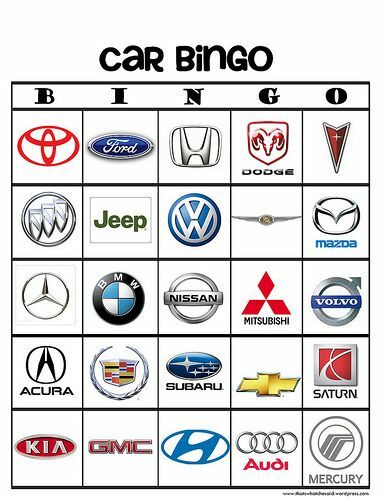 In true Bingo tradition, each player gets a bingo card and when they see a vehicle on their card they cover the space. You can play four corners, a straight line or even cover the whole card. The winner yells.... BINGO!! 5. And the Kid's Choice Award goes to....Present Time! One smart mommy on our team came up with the idea to wrap several small presents so that each of her kids had a gift to unwrap for each hour that they were on the road. Some gift ideas include coloring and activity books, craft projects like this one from Melissa and Doug, small toys, etc. Little ones get so excited to unwrap presents and then have something new to entertain them for a while. So there you go. With these five simple activities, your road trip will be less stress and a whole lot more fun for the whole family. Jennifer Beall Saxton is the founder and CEO of Tot Squad, a trusted partner of retailers, stroller, and car seat brands that offers car seat installation, baby gear cleaning and stroller repair. Franchising opportunities and more information on Tot Squad is available at www.thetotsquad.com.